This projector is perfect for school or business presentations, and will provide you with easy and confident presenting. It boasts fantastic 20,000:1 contrast ratio, and a powerful image brightness of 3200 lumens, so your presentations will appear rich, with easy to read, sharp text, video and graphics, and vibrant colors. The Optoma S316 is equipped with a 1.1x zoom projection lens, an impressive variety of connectivity options, as well as a lamp with up to 10,000 hours of life. This is why this projector is perfect for use in meeting rooms, training rooms, and classrooms. 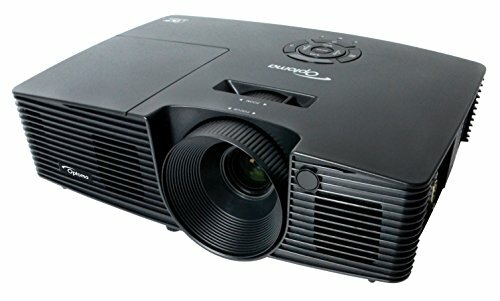 Furthermore, it features Rapid Shutdown, Full 3D compatibility, Quick Resume, logo capture, Auto Power Off, Direct Power On, and much more, so all of your demanding application needs will be satisfied with this projector. The Optoma S316 is a projector ideal for those who are looking for their first time setup and are reluctant to invest heaps of money into something they’re not sure they will like. At a more than reasonable price, the S316 managed to squeeze in a pretty hefty amount of features backed up by some pretty impressive specs (for the price range). The brightness of 3200 lumens is more than sufficient to use in really large rooms. The contrast ratio of 20000:1 is pretty impressive to say the least. Vibrant, rich and true colors enhance the viewing experience. The native resolution is 800×600, able to upscale to 1080p, so it is not a full HD projector in case you are in the market for one. Lamp life of 10000 hours is one of the longest ones in this price range, so if you are looking for a device for a long one, look no more. A heap of great features include full 3D compatibility and many more. If you are looking to view content in 3D, you will need a set of 3D glasses which can support 144 Hz rate. Unfortunately, glasses do not ship with the device, so you will need to spend some extra money in order to get a perfect setup. Other features include optional wireless capability which will allow you to connect the device wirelessly to a PC or a mobile device, an optional, but a handy little feature if you are constantly on the move and need to make presentations within a short timeframe. A large array of connectivity options ensures that the projector is always ready for whatever you require of it. To name just a few, the S316 has ports for VGA2, S-Video, Composite video, multiple audio in and audio out ports, HDMI, USB mini, etc.